Montenegro is a small country with an area of 13812 km² and a population of 680000 inhabitants, located in the southern Balkans, along the Adriatic coast. The terrain is mostly mountainous, except for a small area with plains around the capital Podgorica. Montenegro ("black mountain" in Venetian) has been settled since prehistoric times. In the middle ages, at the peak of its power, it was the centre of a kingdom ruling Montenegro and parts of Bosnia Herzegovina. Later it was annexed by foreign powers, and finally gaining independence in 2006. Montenegro receives a sizable number of tourists due to its idyllic sea coast along the Adriatic, where many picturesque historic cities are located. Montenegro has adopted the Euro as currency. Its economy is relatively developed and the pricing level is moderate to high. There is a train connection to Belgrade and the main airport is in Podgorica. 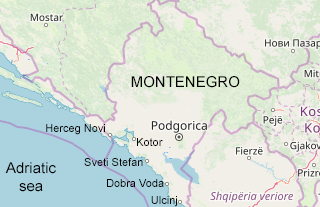 Otherwise Montenegro is well connected to the European motorway network. Accommodation options include hotels and pensions, all bookable via the international booking portals.